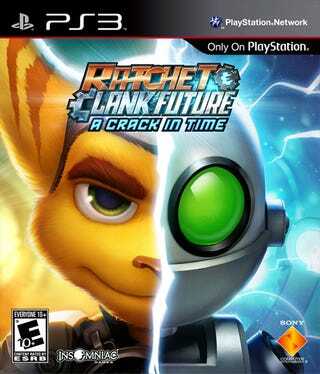 Insomniac Games' latest PlayStation 3 adventure Ratchet & Clank Future: A Crack In Time has an official release date —Tuesday, October 27, at least in these United States. More importantly, there's new box art, complete with snazzy PS3 re-branding. And not a bad piece of art, eh? At least made easier to appreciate with the condensed look of the new PlayStation 3 art template. Not interested in judging a game by its cover? Head to the official PlayStation.blog for further Ratchet & Clank Future: A Crack In Time details, including all those pre-order "incentives" that one can throw good money at and Insomniac's PAX plans. Oh, and for those of us interested in picking apart box art minutiae, the back of the PS3 game case is also available for ogling at the blog. Even the spine!! It's branding heaven. Update: Looks like the PlayStation.blog has removed the full box art for the game, possibly because of the features revealed on the back of said box. That includes things like multiplayer, lobbies, matchmaking, leaderboards, PlayStation Home integration and Trophies. Keep in mind that some portions of the back of the Ratchet & Clank Future: A Crack In Time box are "for presentation only" and not necessarily a guarantee of what the final game will offer. But we're checking in with SCEA to find out what's happenin'.